Spring Valley at Ute Creek - Longmont, Colorado. The neighborhood was established in the late 1990's. The homes were built by Centex Homes. 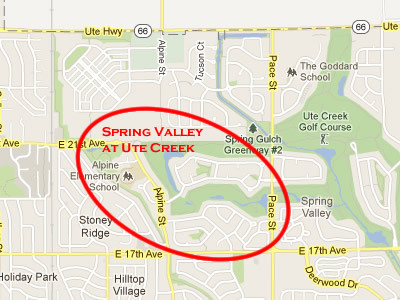 There are 279 homes in the Spring Valley at Ute Creek HOA. The neighborhood borders several holes along the back nine of Ute Creek Golf course. The golf course is named after the creek that meanders through the entire layout and comes into play on four holes. There are also five lakes and two streams that come into play, most prominently on the back nine. The links-style layout features undulating fairways and greens that are heavily guarded by sand bunkers. Ute Creek at Spring Valley is open for public play and it also offers a driving range with putting and chipping greens. The neighborhood also features an elementary school (Alpine Elementary), a city park (The Rough & Ready Park) and some open space areas backing up to many of the homes in the sub-division. There is a coffee shop, Italian eatery, 2 major grocery chain stores, a major pharmacy, two gas stations, an ice cream shop, two sandwich shops and several other small establishments... all within easy walking distance! There is also quick and easy access to I-25 north to Wyoming or south to Denver via state Hwy 66.